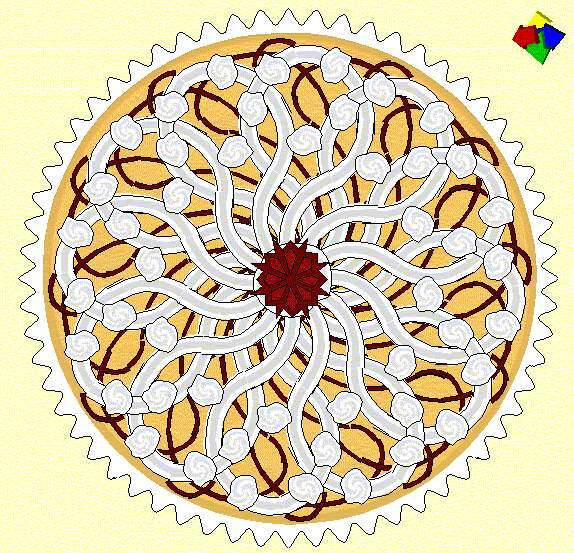 Click on the button 'start' and you can decorate your own flan. Summary You can decorate a pie with fruit, whipped cream, and candy. With your mouse, select items and move them to the pie. A more regular decoration you will get when you use the option "stamp." This stamp will copy, turn, and paste. You can manage the turns by filling in a number of minutes. This activity is based on rotation, and rotation symmetry. The center of rotation is a fixed point: the center of the pie. Instead of an angle of rotation, a number of minutes on a clock is used. For example, a strawberrie and the stamp on 15 minutes, will result in four strawberries. Students may discover that if the number of minutes are a divisor of 60, the result will be a nice symmetrical pattern. However, what happens if the stamp is on 8 minutes? Students can discover a lot with this applet. Links staat de taart die je moet proberen na te maken. Als je een dot slagroom op de taart legt, het aantal minuten op 4 zet en dan op de knop 'versier' klikt maakt de computer een cirkel met 15 klodders slagroom. Je moet nadenken over het aantal minuten dat je kiest, want dat bepaalt hoeveel dingen de computer op de taart legt. Je moet ook nadenken over waar je het eerste stuk slagroom of fruit neerzet, want dat heeft invloed op de richting waarin alles komt te staan.